In 2012, White Rock Baptist Church’s Boy Scout Troop 55 celebrated its 80th anniversary, which makes it one of the older Boy Scout troops in the country. 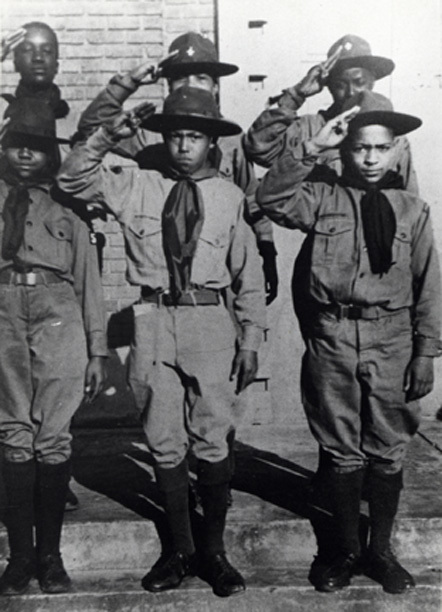 Boy Scouts formed in Durham in 1916, but an all-black troop did not form until 1932. The troop was initially made up of a group of Hillside High School students, among them William Pearson, who went on to become a district court judge. The troop moved to White Rock Baptist Church in 1935, and the church became its official sponsor in 1937. Cub Pack 55 was organized in 1944, the Explorer Post in 1954, and the Girl Scouts in 1951. Despite its long history, the troop has struggled to survive. The troop’s members were drawn from the poorest areas of town, and many of them depended on the church for assistance. Membership dwindled to two boys in 1980, and at times, troop leaders came close to having to pay registration fees out-of-pocket to keep the troop from being disbanded. In early years, the troop faced discrimination, and scouts were not able to wear their uniforms in white areas of town for fear of the reprisal they might face. The troop has seen very few leaders in its eighty-year history, and each has made a positive impact on his community and the boys in his charge. Nathaniel White was a founding member of the first black Boy Scout troop in his boyhood home of Norfolk, Virginia, and he continued scouting when he moved to Durham. He served as Scoutmaster of Troop 55 from 1942 to 1968, during which time he successfully pushed for the integration of the scouting system in Durham. Until 1964, white and black troops operated in separate districts and attended segregated camps. White was a community leader and civil rights activist outside of scouting as well. He was the first black board member at Durham Technical Community College, and he worked with the Durham Committee for the Affairs of Black People and with the Durham Human Relations Commission. But always tell you the truth. But everything wasn’t always hard. Was truly a friend indeed. Troop 55 remains strong, and the White Rock Girl Scout Troop is the largest in the city of Durham.